Lance Corporal C.E. Lowther, 1/6th Battalion, the Durham Light Infantry was killed in action 1 October 1916 and is commemorated on the Thiepval Memorial. He was 28 years old and is commemorated on the Butterknowle War Memorial and the memorial plaque in St. John the Evangelist Church, Lynesack. The service records of Lance Corporal C. Lowther have not been researched but he did not enter France until after 31 December 1915  so did not take part in any actions of 1915. He may have seen action at the Battle of the Somme. This action, the 8th phase of the Battle of the Somme, commenced 1 October 1916. The village of Eaucourt L’Abbaye was captured and the attack is famous for the action of Lieut.-Col. R. B. Bradford who was awarded the Victoria Cross. “By dawn all preparations, including the alteration of watches to winter time, were completed for the attack, which had been ordered for the 1st October. The preliminary bombardment commenced at 7.00am and continued till zero hour (3.15pm) when it changed to a barrage. Unfortunately there were some casualties from shells falling short, the total casualties for the day being about 40, including the Commanding Officer wounded. Lieut.-Col. R. B. Bradford, now commanding the 9th Battalion, asked for and was given permission to take command of the 2 Battalions and for his subsequent work that day was awarded the V. C. He arrived at Battalion H.Q. at zero and at once went up to the front line. The attack commenced at 3.15pm but partly on account of the failure of the 47th Division on the right and partly owing to the wire not being properly cut, the attackers were held up by machine gun fire and suffered heavy casualties. After considerable fighting with bombs and rifles 3 Lewis gun teams of X Company, under 2nd Lieut. T. Little and 2nd Lieut. C.L. Tyerman and one team of W Company under 2nd Lieut. Barnett succeeded in getting a footing in the first objective. During these operations Lieut.-Col. Bradford arrived on the scene and immediately took charge of the situation and under his direction and leadership the whole of the first objective was gained. A Company of the 9th Battalion then came up and using the new position as a starting point advanced and took the final objective after dark. About dusk a counter-attack was attempted by the enemy on the front right. Advancing in extended order, about 20 of the enemy were challenged and they all cheered, shouting “Hooray”. As they showed no further friendly signs they were fired on and driven off. During the night a further counter attack developed from the valley on the right but this was also repulsed. The following day, by organised bombing, the whole of the final objective was captured and held and communication trenches were dug back to North Durham Street. The casualties during the 2 days had been very heavy and included amongst the officers, in addition to those already mentioned 2nd Lieut. Peacock killed and 2nd Lieut. Lean, Capt. Peberdy, Lieut. Cotching, 2nd Lieut. Barnett and 2nd Lieut. Appleby wounded. Amongst the decorations gained were Military Medals awarded to Corporal Dixon and Privates Rushford and Atkinson, all signallers, and Private Turnbull of X Company. Good work was also done by Sergeants Gowland and Winslow. “Somme 1916 Oct.1 At 1am summer time altered back to normal by putting clock back 1 hour, this is to 12 midnight. 2Lieut Yaldwyn (Sniping Officer) attached to Y Company for duty. Commanding Officer saw all Company Commanders at 3am to talk over details of the attack. Completed jumping off trenches about dawn and occupied them in battle order by 6am. 60 men (draft and details) brought up from the Transport Lines to act as Carrying Party for the battalion. Artillery bombardment of German trenches from 7am to 3.15pm. 2Lieut. Yaldwyn wounded about noon. The Commanding Officer Major Wilkinson wounded about 1.30pm. Lt. Colonel Bradford of the 9th Durham L.I. took over command of the Battalion for the period of the operations. 3.15pm Assault delivered. 1st objective gained ?on the left later on the right also. 2nd Lieuts ? Cotching, Barnett & Appleby wounded. Considerable amount of hostile Machine Gun fire from the right during the attack. German trenches not much damaged by Artillery fire. Block established on the right as troops on the right had not obtained their objective. 1 Company of the Durham L.I. sent up to re-inforce. About midnight 2nd objective was gained by combined assault. 2 German bombing attack on our 2nd line right repulsed in the early morning. Fairly quiet day but wet. During the night of the 2/3rd 6 Durham L.I. and 9 Durham L.I. relieved by 7 Northumberland Fusiliers. The war diary contains no summary of casualties for the month of October. 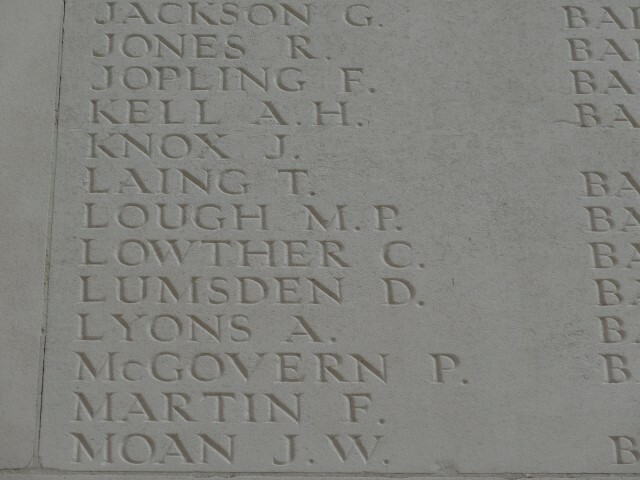 Lance Corporal C. Lowther was killed in action 1 October 1916. He has no known grave. Lance Corporal C. Lowther was awarded the British War and Victory medals.